Style Rx: How to Rock Boots with Skirts! In case you missed it, I started a new series called ‘Ask the Style Medic’ where you can send me your style, fashion, wardrobe, shopping, or money saving (it is my super power you know) questions. Watch the hemline: The most flattering look for boots worn with skirts is to keep the hemline (bottom) of the skirt higher than the boot. Basically, you want to have a little peek of skin between the skirt and the boot. Obviously this isn’t a big deal with maxi skits. 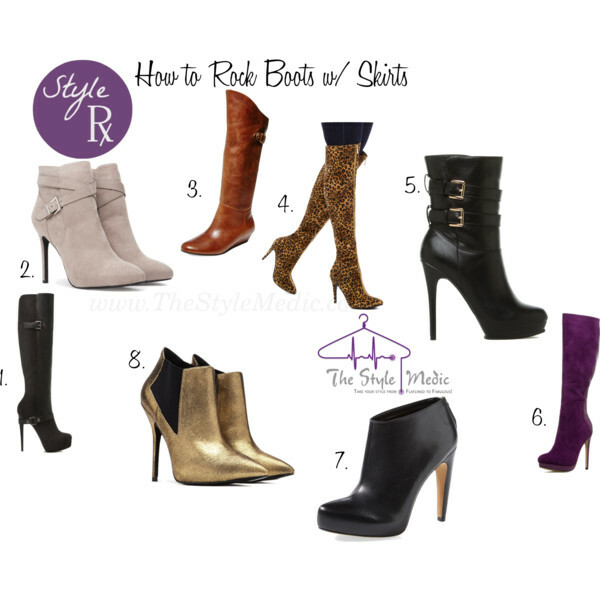 Mini – Go ahead and rock boots with your mini skirt or dress but pay attention to the heel and boot shaft height. You don’t want to look like Julia Roberts on Pretty Woman. Go for mid-calf length to dress it down or booties to dress it up. Midi – The best boot pairing with mid length skirts is an ankle boot. Depending on the skirt length, you could also rock a knee or thigh high boot. Maxi – If you’re rocking a maxi skirt, the type of boot isn’t as important as the heel height. Rock a higher heel to avoid looking too casual or frumpy. Keep out the cold: As the temps continue to drop, it’s just good fashion sense to pair your skirts with tights for a little warmth. You could add an extra dose of personality with funky colors and prints. Some tights are even fleece lined to make them even more warm and toasty. Dress for the occasion – While a good pair of boots can take an outfit up a notch, not all boots are created equal. At work, for example, you might get away with rocking a pair of heeled ankle boots or knee boots, but thigh-high versions may be a little risqué. Also, unless your workplace is super casual, I’d avoid wearing Uggs or similar weekend friendly styles. Pick a star and let it shine – If your boots feature studs, zippers or other adornments, let them be the star of the outfit and keep everything else simple. You don’t want to overdo it. What say you? How are you rocking boots this season? Next Story → Go Confident. Go Commando! Whoo hoo! Now I just need to find some more skirts to rock with all my boots! Great tips! I'm all about the ankle boot right now. Love the pointy metallic ones listed!